The "Lucas" armour series was especially designed for kids. The bracers and greaves are a little shorter, so that they fit smaller arms and legs. The chest plate is made for smaller bodys, but can be enlarged by carefully bending it with the wearers growth. The chest plate is a historical copy and has no back plate. it is closed on the wearers back by closing two leather straps on the buckles on the sides. Steel bracers and greaves are not only suitable for in-game protection when blocking blows to the arms and legs, but also protect in real life: whenever the kids roam through the forrests and parks, their legs and arms may get scratches and bruises. Shins and lower arms are well protected with a layer of steel greaves and bracers. 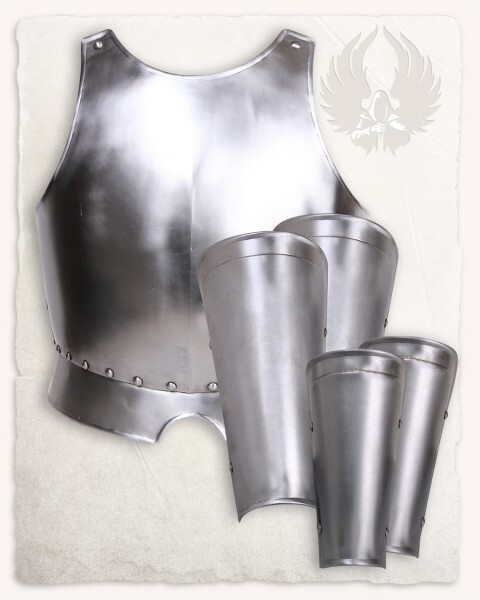 We offer a complete armour for the younger heroes with an unbeatable price with this set. May it be a black knight or a wild burglar - black is the basis for many protected heroes. We suggest to wear a set of padded bracers and greaves to worn underneath any steel armour, as it will prevent bruising and cutting of the skin underneath and maximuses the comfort wearing steel armour - be careful and protect yourself at all times.